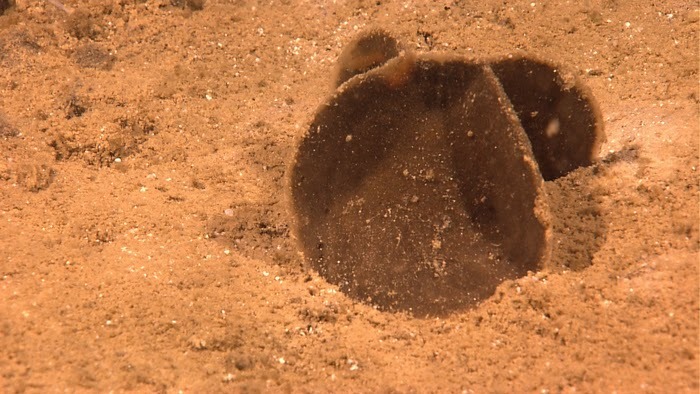 The Echinoblog: Giant Deep Sea Amoebas! Meet the Xenophyophores!! Giant Deep Sea Amoebas! Meet the Xenophyophores!! 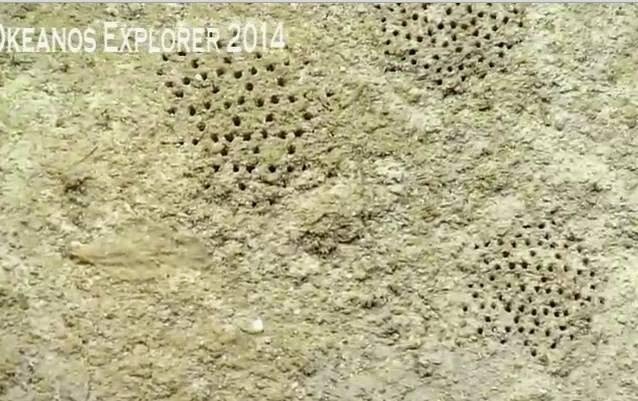 So, following up with all of the NOAA deep-sea Okeanos Explorer stuff, I've found that I am just FASCINATED by these things called Xenophyophores!! The name means "Bearer of foreign bodies". But what are they? To put it they simply, they are giant, deep-sea amoebas that live in large, sediment "houses" called "tests" (similar to the way that echinoderm skeletons are also known as tests). Footnote on the classificaiton: a quick survey of the various Protist classifications tells me that even calling these organisms "amoebas" is probably incorrect. But the nuances of this dynamic are for another day.. This one group, the Xenophyophorea live in the deep-sea.. DEEP in the deep-sea! Xenophyophores were observed as deep as10 KM (over 6 miles!) in the deepest of marine trenches (the Mariana) and occur in almost ALL of the world's oceans (except the Arctic). They are considered among the world's largest living SINGLE CELLED organisms. Xenophyophores create these large tests which they inhabit. The tests come in a variety of forms. There are 42 known species in 13 genera. As I understand it, xenophyophores are considered as a subgroup within the Foraminifera (these are amoeba-like unicellular organisms with tests). From the NOAA Photo Library here. 1. How Big Are They?? So, here's the thing. I've read plenty of accounts that jump to the conclusion "These are the MONSTER AMOEBAS!!!" But what a lot of these accounts seem to forget is that the large sizes considered by a lot of popular accounts are the TESTS (i.e., the skeletons). To be sure, these structures can be pretty big (for something made by amoebas!) The example below is apparently about 25 cm (almost a foot!) across! 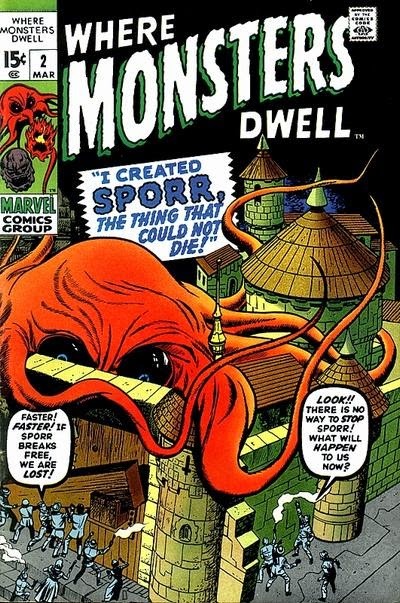 Most of the accounts I've read sort of assume (and I suppose this is reasonable) that the animal inhabits ALL of the test all the time, or perhaps with pseudopods or tentacles extended throughout? Frankly, none of the accounts I read could clarify how much of the test, the actual organism inhabits. However, One estimate (here) indicates that the test volume might be as little as < 1% "protoplasm" (which if I understand the terminology includes cytoplasm, etc.).. so, the actual organisms are probably not as monstrous as some folks would think. I would imagine its quite difficult to measure an amoeba for something like this. One paper by Laureillard, Mejanelle and Sibuet from 2004 studied the xenophyophore Syringammina corbicula and utilized a study of various lipids and amino acids to look at their nutrition. Their study showed that bacteria were present in great abundance! Xenophyophores have strings of mucus which are deployed along the test which build up feces and sediment called stercomes. It was suggested that a flora of these bacteria were present in abundance on these mucous threads. Perhaps being farmed and being utilized as a source of food. Their mucous threads also are constantly pulling and trapping particles from the surrounding area, presumably in part to provide further nutrition. So, there seems to be a heavy dependence on poop and other "marine snow" that falls down to the bottom.. as well as bacterial/microbial growth. But very little is known about feeding in xenophyophores, so who knows what else they do?? 3. What are those structures (tests) made of? Probably the most interesting thing that I've picked up about Xenophyophores?? Is how potentially important they are to deep-sea ecosystems. Xenos are VERY abundant in the deep-sea, sometimes reaching up to 2000 per 100 square meters! Lisa Levin published this neat paper in 1991 about their roles in deep-sea communities. Basically it turns out that where xenos are found, there are "hotspots" of animal diversity! 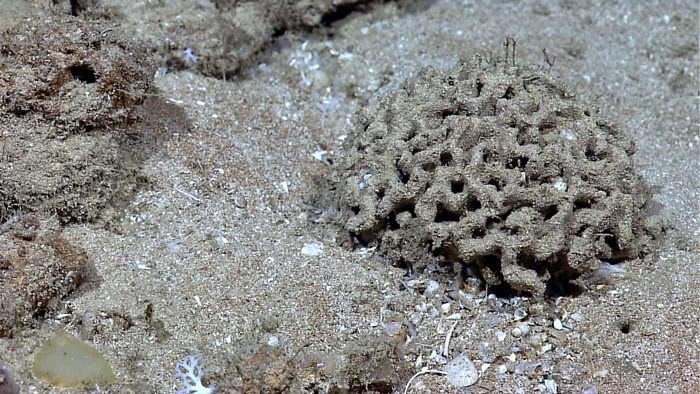 Why might a cluster of xenophyophore tests represent a "hotspot" of animal diversity?? They apparently present both food AND habitats for a plethora of deep-sea animals! Examples of how animals use these tests? Plus other MORE! Possibly/probably associated with the bacteria growing on the surface?? So, one of the aforementioned articles by Levin on Xenophyophore paleoecology makes the case that tests and other modern examples of sediment structures by these organisms can explain various trace fossils, and other mysterious fossil structures. Perhaps one of the best known is that of the fossil ichnogenus (like an organism name but for a trace fossil) Paleodictyon! Paleodictyon was famously studied by oceanographer Peter Rona who made it an obsession of his career. It has covered by many other natural history blogs such as this and this. Basically.. a trace fossil which looks like this. This is seen throughout the deep-sea in many places. The above image from the Gulf of Mexico but its been seen throughout the deep-sea, sometimes as deep as 3700 meters!! Its also been seen in the fossil record.. dating back to the Paleozoic... The parallel and similar appearance has led to much debate over whether the same type of organism has created these patterns in the sediment.. namely, did a xenophyophore or something similar create them?? Oh those are truly cool, Chris! Huge foram-y things in the deep sea!! bet they are farming bacteria - other protists do that, and other cool tricks like stealing chloroplasts and keeping them alive and photosynthesizing. 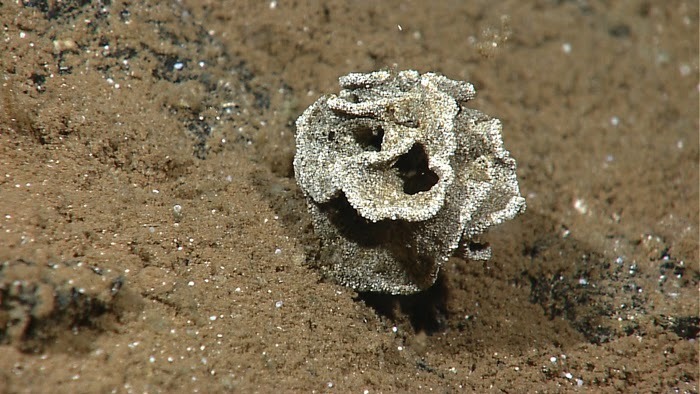 This blog post about cool new species in 2014 has a great bit about a giant foraminiferan that has the same feeding strategy as a carnivorous sponge - it sticks all the sponge's spicules together very carefully and kind of mimics it. Check it out - Spiculosiphon!! Do you think that some sort of proto-Xenophyophores with slightly more complex test patterns could be responsible for the Ediacarian fauna? Talking of "off topic" you see this, Chris? Thomas- there's a host of hypotheses about the Ediacara and some of the "rules" which we normally apply to studying historical faunas of animals are thrown out the window. Difficult to say. Cecily- yes! thank you! My Twitter feed is exploding with interest about Dendrogramma! Its a fascinating discovery!